The strength of Shannon’s empathy for this plant is so great that one could rightly mistake her for a Druid (unless, of course, they were also aware of her notoriously black thumb). For years, though, this hardy little plant has managed to not only resist her finger of death but also routine snacking by our first cat, Emma. It is a remarkable survivor. 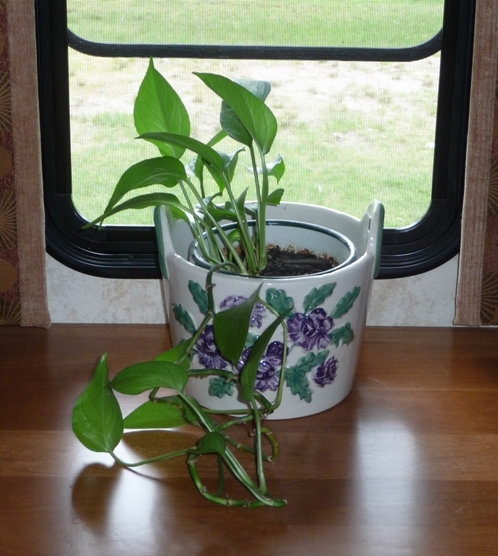 Uncertain how the plant would fare in the RV, Shannon considered entrusting its care to her mother while we were on the road. In the end, Shannon decided to take it with us. And it was good. Sunlight has done remarkable things for our spindly little friend, and it has thrived during our three months of travel. But now, as we prepare to make way for the Canadian border, we are certain there is one thing this plant will not survive: customs. Either when crossing this way or that, some douchey customs agent will declare this little plant a dire national threat and, for the sake of God fearing Canadians or Americans everywhere, will do their heroic duty and have it destroyed. Of this, we have no doubt. Fortunately, we are close enough to relatives who kindly agreed to act as “plant sitters” while we don berets in le Canada Français. Of course retrieving said plant upon our return will require a two hour round trip drive and a $25 ferry ride. Such is the burden of vagabonds who become attached to things. We have been known to put a special plant in the bathroom sink or shower, or tuck it in a cupboard somewhere. We have a cactus that sits on our dash that has probaly been through Canadian, US and Mexican customs at least a dozen times and it’s still with us, never any questions asked. We have decided that the first customs agent anywhere to question the plant gets it. With a story like this, I really hope the plant survives being “plant sitted” (“plant sat”?) by Aunt Sharon! I hope it lives to tell another tale! Inquiring minds need to know-did the plant sneak into Canada?? The plant stayed here. Shannon didn’t want to risk having it destroyed so we left it with some relatives while we were in Canada.